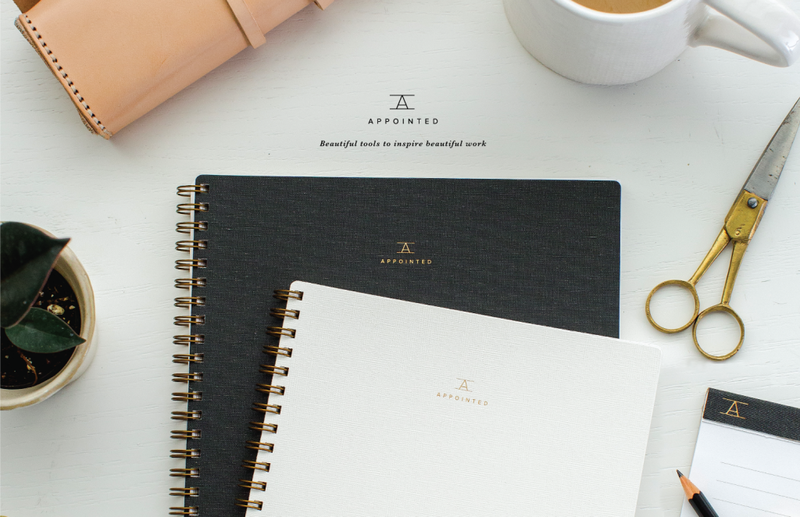 One of my favorite boutique stationer designers, Suann Song, is making headway with her recent Kickstarter Appointed, a gorgeous collection of tools to inspire the writer within you. Suann has raised well beyond her initial pledge yet the incentives for becoming a backer are too difficult to pass up, so much so that I recently became a backer (only a few more days before it closes!) 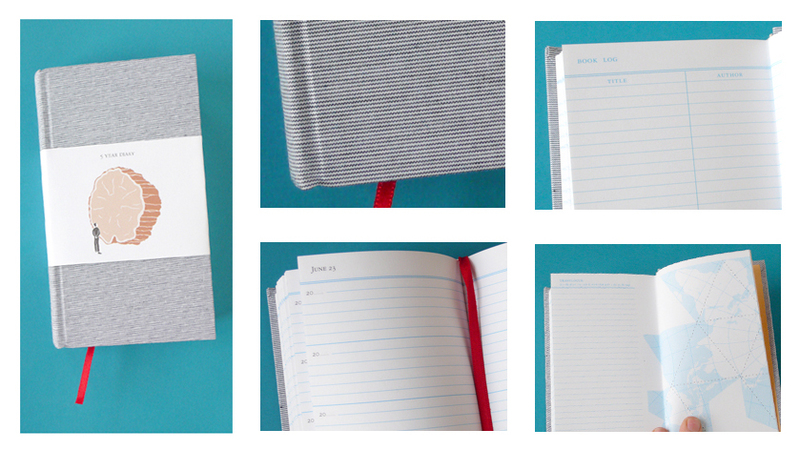 Look for this handsome collection to be a part of the Brown Ink Paper Goods boutique this coming Fall! 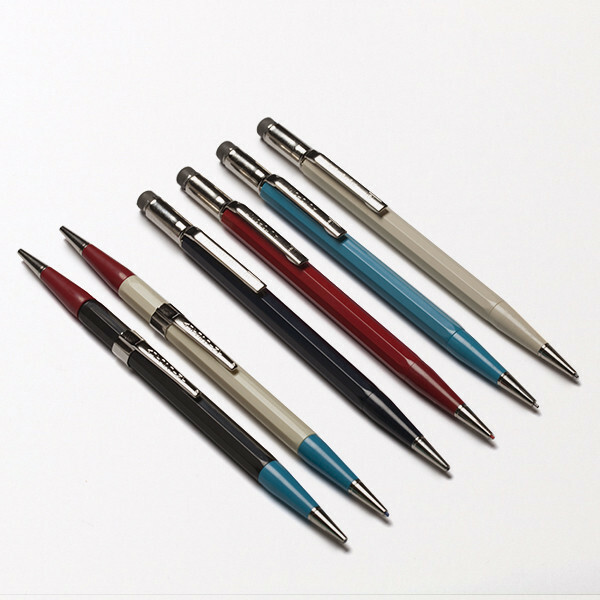 Talk about handsome, Autopoint, a 1918 company known for their All-American, fail-proof construction, has just come out with these timeless, mechanical pencils found on Best Made. Being “old school” has its beauty, literally, in this lovely story used in the Hermes SS15 catalogue seen on Keep it Chic, where keeping a diary has become chic once again. Thanks for keeping it old-school with your hardcover agenda, Preston Davis. One of the greatest artists of the 20th Century, the work of artist Martin Ramirez has been honored by the U.S.Postal Service by the new Forever Stamps. His work is stellar as he combines his personal take on the landscapes of life in Mexico with American culture. 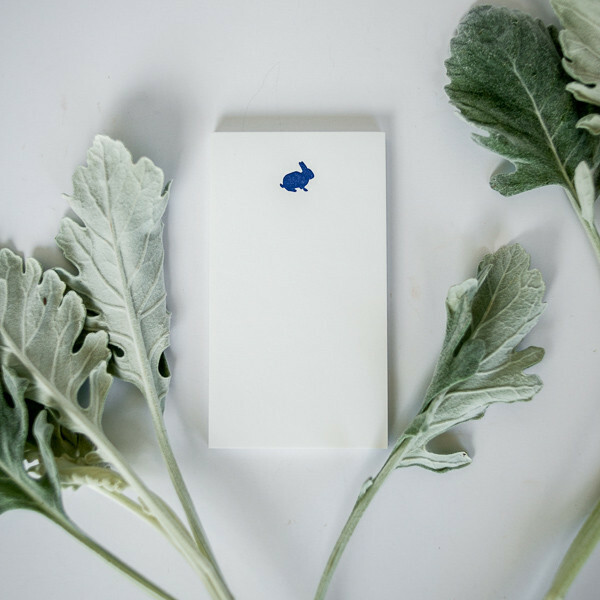 Back again, the inspiring folks from Egg Press and Hello!Lucky are challenging us all to write one letter, each day in the month of April with their Write_On campaign. Seem daunting? It may help to hear this group is kindly mailing out free Writing Kits to anyone up for the challenge. This year, I am fully onboard. As they mention in the video, both the act of writing and receiving a letter can bring a welcome change in your own life as well as others’. 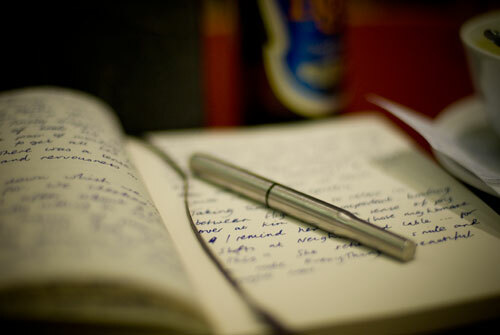 There are more reasons to write than you might imagine. Right on, #write_on — A worthy challenge. Happy Spring. Happy April. Happy Writing. 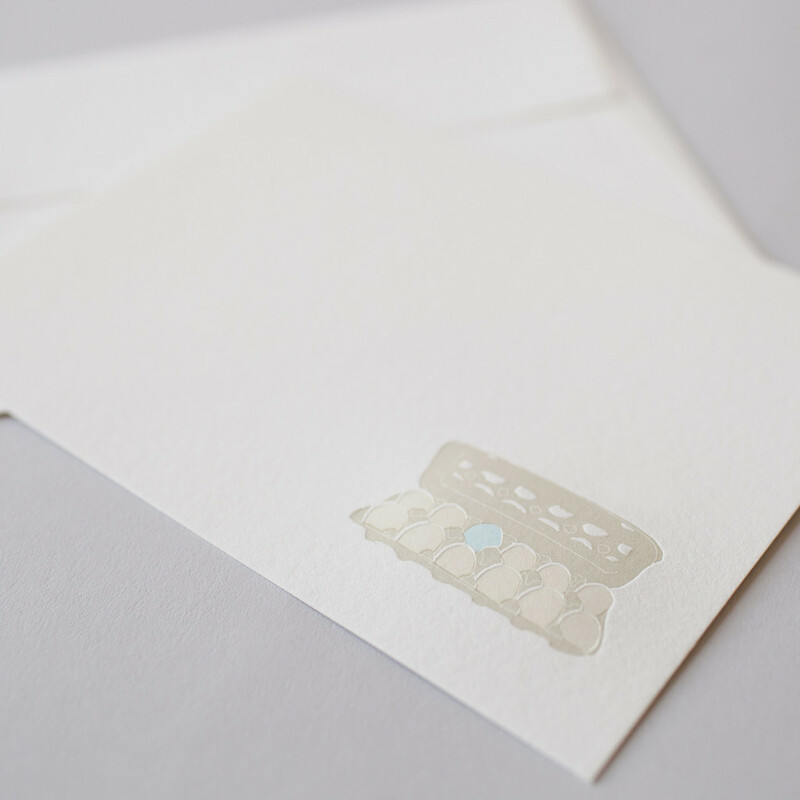 With the recent and celebrated arrival of Spring, it’s a perfect time to debut our new Featured Designer, Brown Parcel Press out of Sparta, Georgia. 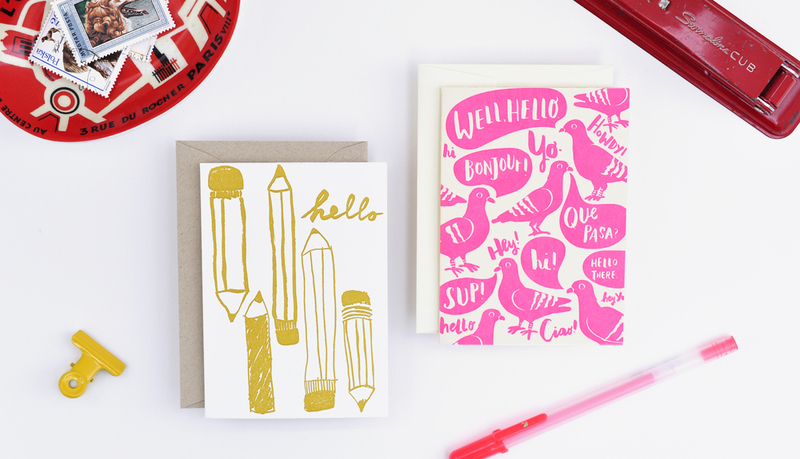 The moment I caught on to the talented owner and designer, Megan Fowler, I was completely hooked by her letterpress goods. Check out our most recent additions to her this beautiful, handmade line! And maybe pause, just for a moment, to think about who in your life could use a good pick-me-up, not only by the beauty in the card but by your handwritten thoughts. Happy writing friends. 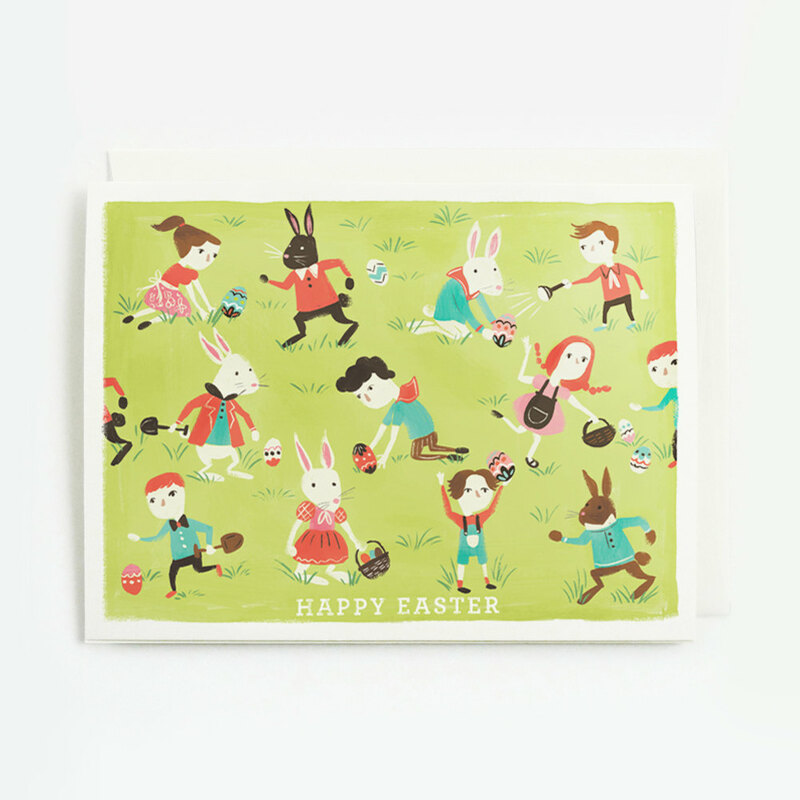 …this egg hunt Happy Easter card with its bright, pastel palette from talented Yas at Quill & Fox! 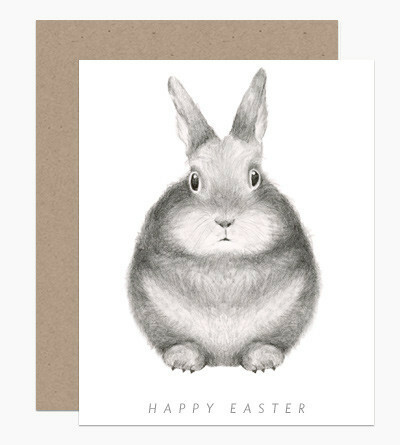 There is no other Bunny quite like this beautifully illustrated Dear Hancock Easter Bunny! 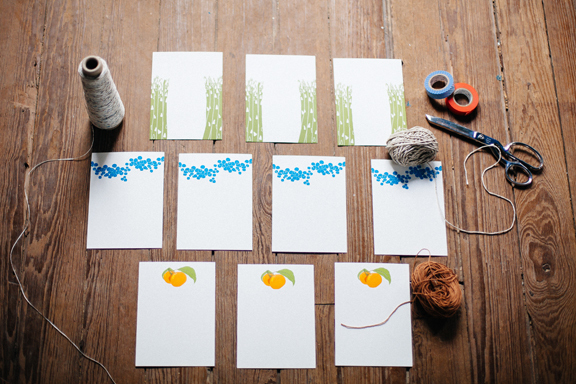 Be different with the unexpected Fresh Dozen Easter card from Brown Parcel Press. Don’t forget to fill your baskets with gifts from the thoughtful Easter Bunny! 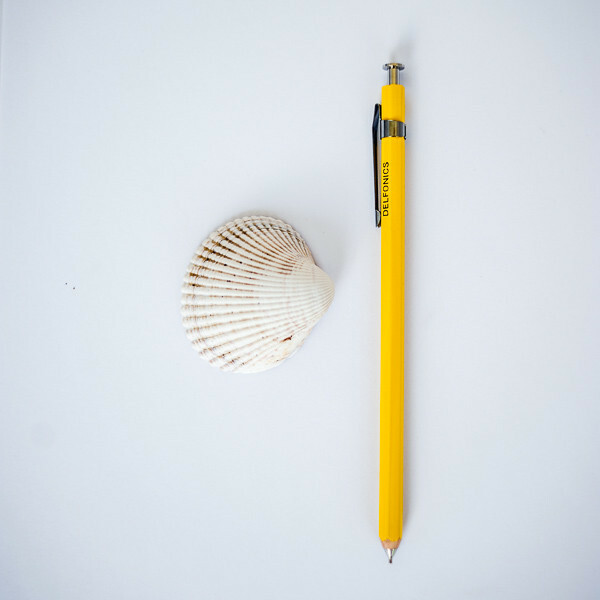 …especially if you attach a hip, bright Delfonic mechanical pencil (comes in hot pink as well!). 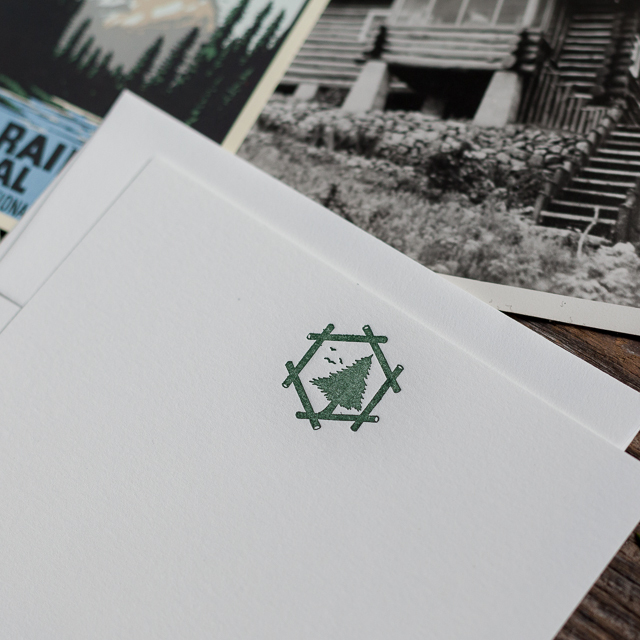 I’ll be back later this week with new designs from our next Featured Designer, Megan Fowler of Brown Parcel Press. Now off to order a few dozen Coconut Marshmallow Bunny Hops (aka peeps) from local favorite Lucia’s…which may or may not make it into the baskets this year! I love traditions. Every year after Christmas I look forward to the arrival of Grandma Sally’s Springerle cookies which she consistently makes in the early part of the new year. Being a crisp cookie topped with anise seeds, Springerle is often not for everyone and is definitely an acquired taste. But over the years I’ve become a huge fan, especially knowing the beautiful cookies were made in my mother-in-law’s kitchen! So last month when Sally asked me if I would like to take part in her tradition, I jumped at the chance to learn the ins and the outs of Springerle. 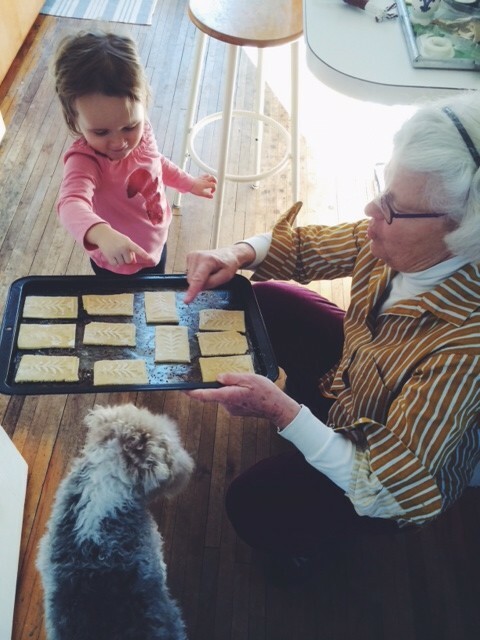 I knew the cookie is not a quick one to make – you let the dough chill for a day and then wait another day for the cookie shapes to dry before baking – but Sally was ready for her students, Beatrice included. 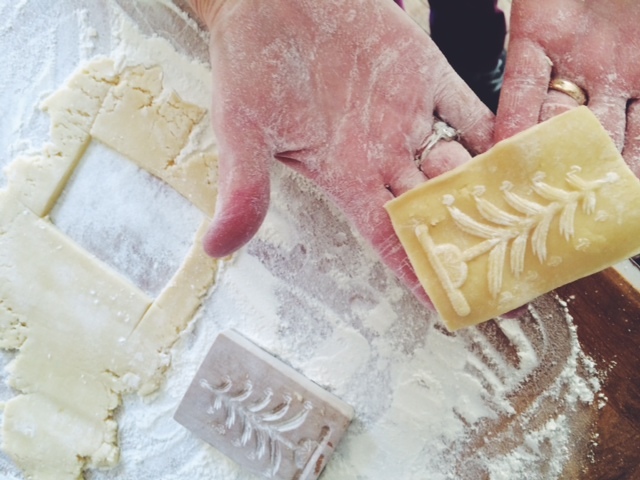 Sally has been creating Springerle for years having made these cookies as a child with her mother. It was a German tradition her biscuit-loving relatives had brought over from Europe. Sally takes pleasure in the three day baking process and also the sentimentality behind this traditional, Winter cookie. 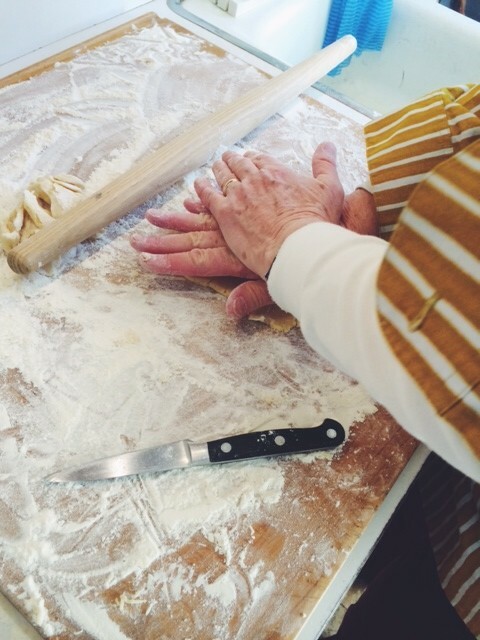 As Sally and I began rolling out the dough, pressing the cookie mold, and cutting the shapes so delicately, I couldn’t help but notice her cookbook close at hand. This book was far from any ordinary cookbook. 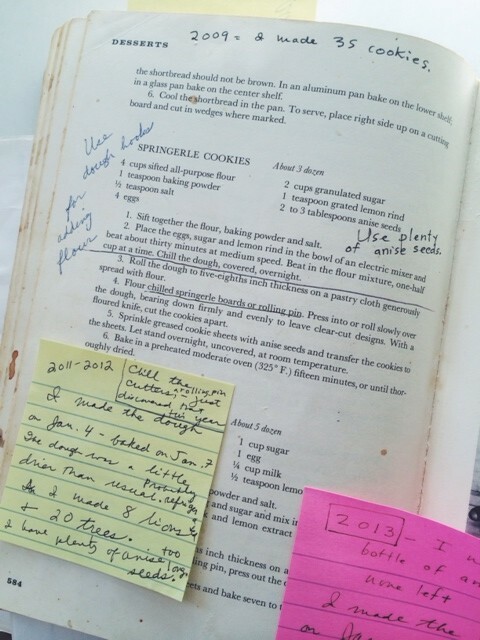 What I found was more of a well-loved and well-used cooking journal of sorts. 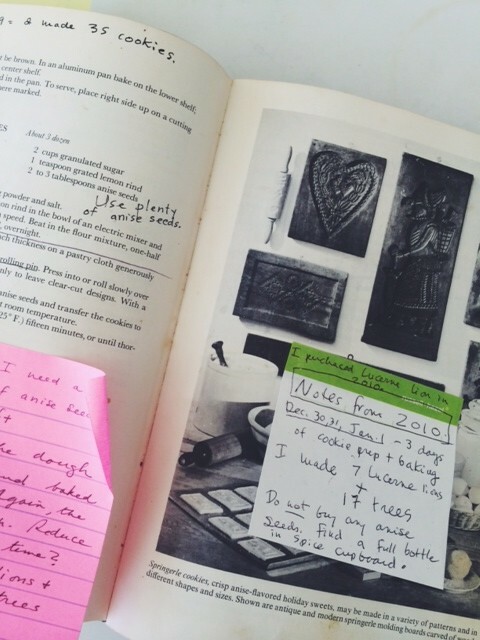 Handwritten notes were both taped onto the pages as well as written on the actual pages of the cookbook. 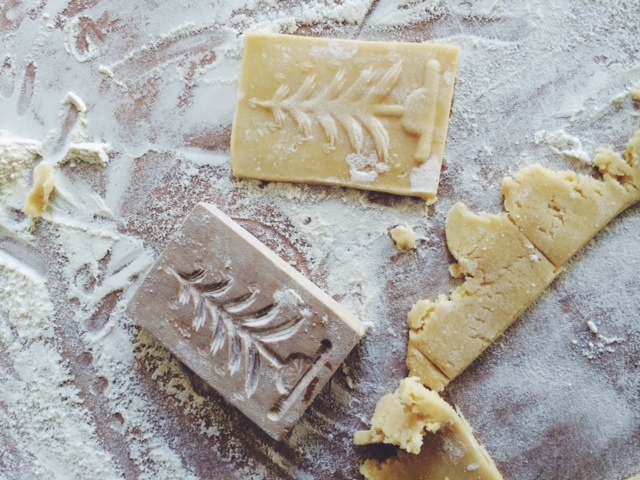 Detailed reminders of ingredients to buy for next season, notes on the quality of the dough, the dates and amount of cookies baked, which molds were used and general baking suggestions could be found throughout the pages. This was so representative of Sally, not only thoughtful in her baking but also one to write everything down. Of course, aside from the cookies, after we finished molding our gorgeous biscuit shapes, Sally did not let us depart without a Springerle recipe card which she hand wrote herself, of course. I can only imagine the smudges, added notes and baking suggestions which will be added to this new recipe card for years to come as I continue the tradition with my own children. Thank you, Sally, for both old and new traditions and the value you give towards handwriting in your life.